We got together with YouTuber and mega bass catcher Bama Bass and asked him a few questions about Fishing, life, and the experiences of being a face in the industry. He had a lot to share and his answers provided another look into the life of one of our favorite anglers! What do you do aside from fishing, work, Hobbies, etc. ?My full time job is an Electrical Engineer, part time job is YouTube (as much as possible). 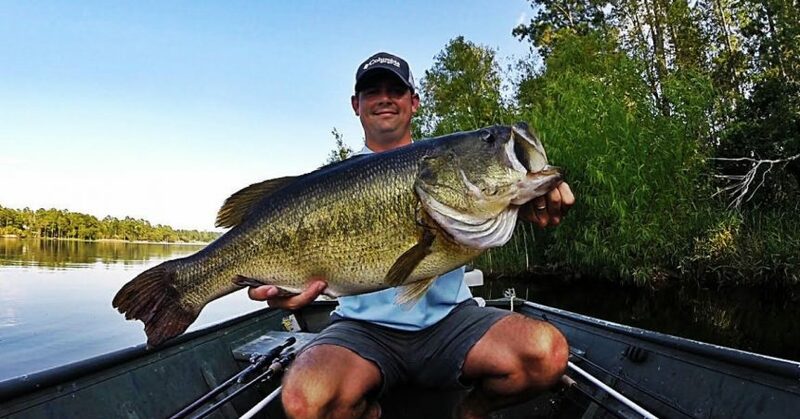 As for hobbies, I have always enjoyed raising pet largemouth bass and have done it since I was a kid. My two pet bass, Bonnie and Clyde, recently outgrew their 300 gallon aquarium so I just built them a backyard pond. That was a fun project! What is your favorite place to fish and species to target? My wife, Liz, and I travel across Alabama searching out any lake that holds giant largemouths. On most of our fishing trips, we use big baits like 12 inch worms and in hopes of catching the biggest bass in the lake. If you watch our videos, you know that she is usually the one catching the big ones. We recently had our first child, a 5 month old baby girl named Sarah. If she is anything like her mother I have become a permanent net man! What are you most proud of related to your channel? It would have to be our Topwater Blowup series. I have spent hundreds of hours behind a zoomed in camera filming bass exploding on topwater baits. We take the best blowups from a month of fishing trips and compile them into a short, action packed video. One of my favorite topwater techniques is what I call the “Toad Dangler”. We intentionally cast a frog over a limb and dangle it just above the water until a bass goes airborne to eat it. In my opinion, it is by far the greatest moment you can ever experience in bass fishing! What about making YouTube videos has surprised you the most? The impact we have had on others. I have made countless new friends and formed relationships with people that I would have never met if it weren’t for YouTube videos. The engagement with our followers is what keeps me motivated to film. Sometimes it is an email from a subscriber with a picture of their new PB thanking us for teaching them a technique and other times it may be an exited kid that we inspired to get an aquarium and raise bass and bluegills. We are passionate about the outdoors, and YouTube provides the platform to teach and unite us all. What is the hardest part about making YouTube fishing videos? In the beginning it was learning how to edit. I had a vision for what I wanted my video to look like but not enough software knowledge to make it happen. But currently, there really isn’t anything hard about making the videos. If you have been doing it as long as I have, it becomes second nature. Just hit the record button and go fishing! Who got you into fishing and what were you targeting? That would be my mom. When I was about 5 years old we would go to her friends house that had a pond. I didn’t have a fishing pole so I would tie fishing line around my finger and use bread as bait to catch bluegills. Man, those were the days! Comment you see most on your fishing videos? Do you ever fish any public water or do you mostly fish private lakes? As I mentioned above most of our trips we are targeting big bass. Unfortunately, the only public body of water near where I live is the Mobile Delta. Saltwater stunts the growth of the bass and my biggest from there is about 3 lbs. So we travel to mostly private places nearby looking for bigger fish. Some people don’t see the sport in fishing a stocked lake but I can assure you, there is no such thing as catching an easy 10 lb. bass. The biggest bass in the lake is always the smartest. Funniest moment on the water? I have had a bunch but one that stands out is when I was fishing with Mike, (1Rod1Reel). We were using live crawfish as bait and after he caught a bass he thought his crawfish was dead. I told him to put his finger inside his pincher to find out. The crawfish latched on and I can still hear the sound of him screaming to this day! What is your PB Bass?